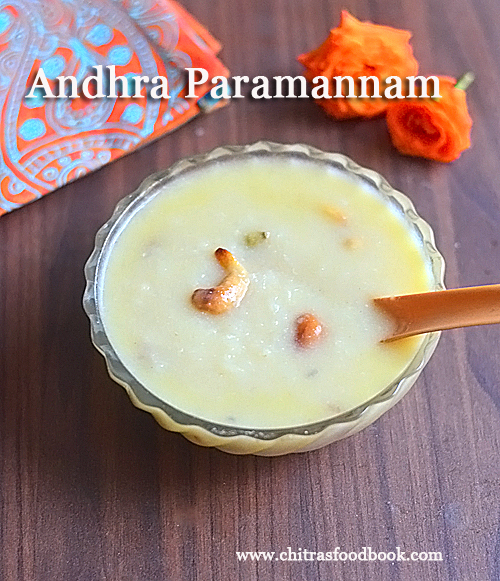 Paramannam is a rice based sweet dish that is most popular in Andhra. 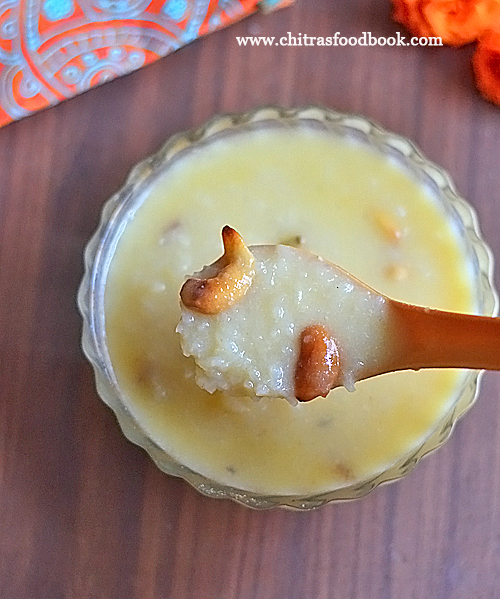 This Indian dessert recipe is also known as annam payasam, bellam paramannam in Telugu. In simple words, bellam paramannam is nothing but Andhra style rice payasam with jaggery. It is one of the most important naivedyam recipes that is offered to God for festivals like Sankranti, Varalakshmi Vratham, Ganesh chaturthi, Navratri and much more. This sweet dish is prepared with rice, milk, sugar or jaggery, nuts and ghee. Authentically paramannam is made by cooking raw rice in milk in an open pot. But I prepared this bellam paramannam in a pressure cooker. 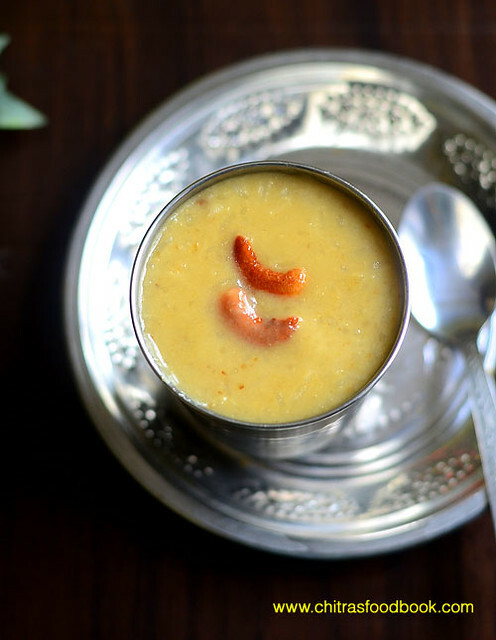 It took just 15 minutes for making this Andhra style payasam recipe. Consistency of paramannam depends on the quantity of milk and jaggery syrup. It looks thin when hot and it thickens over time. So you can adjust the quantity of milk as per the desired consistency. There are chances of paramannam getting curdled when you add jaggery syrup to the hot milk. So you should always add the jaggery syrup after switching off the flame. You can make it perfect all the time. So friends, try this yummy Andhra style paramannam recipe during this Navratri festival and enjoy. Lets see how to make bellam paramannam recipe with step by step pictures. Check out my other Andhra recipes too ! 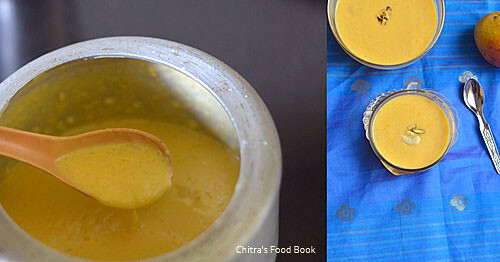 Andhra style rice kheer with jaggery - Bellam paramannam recipe with step by step pictures. In a pressure cooker base, take the rice, milk. Put a spoon inside the cooker to avoid splashing of milk. Pressure cook in low flame for 2 whistles. Switch off the flame. Open, mash the rice well. In a pan, melt jaggery and make a thin syrup. Strain and add the jaggery syrup to the cooked rice when warm. Mix well. Add the cardamom powder, roasted nuts. Boil in low flame for a minute. Switch off the flame and serve hot or cold. Wash the rice. In a pressure cooker base, take the rice, milk + water or milk alone. Add a pinch of salt. Mix well, drop a small plate or spoon inside the Cooker. It helps to avoid splashing of milk while it whistles. Pressure cook in very low flame for two whistles. Open the cooker after the steam is released. Remove the spoon. Mash the rice with a whisk and make it mushy. Add some water if it's too thick. Boil for a minute. Remove and Set aside. In a bowl, take the jaggery and add water. Boil and melt the jaggery completely. Make a thin syrup. No need to bring any consistency. Switch off the flame and let the syrup becomes warm. Strain the syrup in a metal strainer. Add to the cooked rice. Mix well and check for consistency. Add more boiled milk or water if needed. Do not switch on the flame. Heat ghee in a small kadai. Roast the cashews and raisins till golden. Add to the paramannam. Add cardamom powder. Mix well. You can add a pinch of edibke camphor if you like. Now Switch on the flame and keep it very low. Boil for a minute or two. Mix now and then. Do not roll boil. Paramannan should be just heated. Switch off the flame and keep it aside. Serve hot or cold as you like. Adjust the quantity of jaggery as you like. Do not add hot jaggery syrup to the payasam. It may curdle. Instead of pressure cooking, you can cook the rice in an open pot. But keep stirring every now and then to avoid burnt bottom. You can also cook the rice in equal quantity of water and milk. You can add a pinch of edible camphor for more flavor. Yummy, Andhra style rice kheer with jaggery is ready to serve. Tastes the best when served chilled. Technorati Tags: Paramannam recipe,Bellam paramannam recipe,Andhra style rice kheer,paramannam with jaggery,paramannam in pressure cooker,how to make paramannam recipe,how to make bellam paramannam. We celebrated Maha Shivaratri festival today. I made Sadudana kheer with sugar ( Sago kheer in English, Javvarisi payasam in Tamil, Sabbakki payasa in Kannada, Saggubiyam Payasam in Telugu, Sabudana kheer in Hindi) using big, white sago for the first time. Its an yummy Indian dessert recipe. Usually I make this kheer instantly by roasting nylon sabudana / nylon javvarisi( small sized). But this year, I wanted to try with maavu javvarisi which we use for making upma/ Kichdi.I watched a Marathi video in Youtube channel and tried this recipe. It came out very well. It tasted so rich and creamy with all the full fat milk, sugar, nuts and saffron. I loved it to the core. For variations, you can also use condensed milk instead of milk & sugar. Sendhil loves sabudana kheer with jaggery more than sugar. So I am planning to prepare it with the leftover sago tomorrow for Thursday Guru pooja. Sabudana kheer is one of the most commonly prepared vrat ki recipes / fasting food across North India. Basically Sabudana/ sago is healthy as its made from Tapioca. It has so many health benefits. Hence its considered as one of the best baby/toddler foods. Its good for muscle development, helps to gain weight, good for bones, improves digestion, energy levels and reduces body heat. Even though it is high in calories and full of carbohydrates, it keeps the tummy full for long time.So people make sabudana recipes on vrat/ fasting days. Just 100gms ( 1 cup) of serving has more than 200 calories. Hence its advised to consume in small amounts. . Ok, Lets see how to make sabudana kheer with sugar / Javvarisi payasam recipe with step by step pictures and video. How to make sabudana kheer/ sago kheer/ Javvarisi payasam for Shivratri fasting and Navratri festival. Wash the sabudana twice in enough water. Drain it. Add 1/2 to 3/4 cup of water to it and soak it overnight or minimum 4 hours. In a kadai, boil 1 cup of water. Add soaked sabudana with water. Cook in medium flame till sabudana turns translucent. Stir constantly. After its cooked well, add milk and boil for 5 minutes. Add saffron threads while milk boils. Sabudana cooks completely. Add sugar. Mix well till sugar dissolves. Give a boil. Check for thickness and add more milk if needed. Switch off the flame and add cardamom powder. 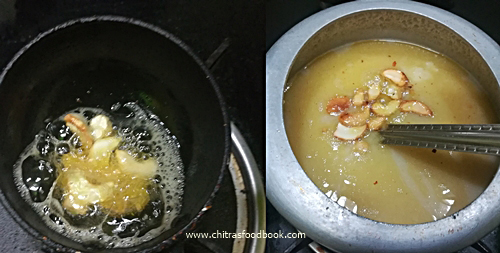 Roast nuts in ghee and add to kheer. Mix well and serve warm or chilled by refrigerating it for 30 minutes. Take sabudana/ sago in a wide bowl and wash it twice adding enough water. Drain the water completely. Add 1/2 to 3/4 cup of water and soak it for minimum 6 hours to overnight ( 12 hrs). It will increase in size after soaking. Take a wide non-stick kadai. Add water and let it start to roll boil. Add sabudana with soaked water. Mix well and cook in medium flame till it turns translucent. It takes nearly 10 to 15 minutes to cook well. Stir occasionally to avoid sticking to the bottom of kadai and becomes like porridge. When its 80% cooked, add milk and boil for 5 minutes in medium flame.Add saffron threads while the milk boils. Kheer turns mild yellow in color due to saffron. If you want white colored kheer, avoid saffron. When the milk becomes slightly thick and sabudana is completely cooked, add sugar. Mix well and let the sugar dissolve. Check for consistency of kheer. If its too thin, let it boil for some more time. If its too thick, add little more boiled milk to bring desired consistency.Switch off the flame. Add cardamom powder to the kheer. Roast cashew + dry grapes till golden in 1 tsp ghee and add to the kheer. Mix well and serve warm. If you like to serve chilled, refrigerate the kheer for sometime and serve. Remember this kheer thickens after it cools down. So add little milk and adjust its consistency when needed. Enjoy with yummy sabudane ki kheer along with poori , sabzi & rice for breakfast or lunch. Quantity of milk should be adjusted as per your taste and desired consistency. For variations, you can directly cook sabudana in milk instead of water but milk may curdle. To avoid this, we are cooking in water firstly and add milk to it. If you are using small sized nylon sabudana, you don’t need to soak it. Just wash it twice and cook in water directly. Bigger sized sabudana needs to be soaked for more time. 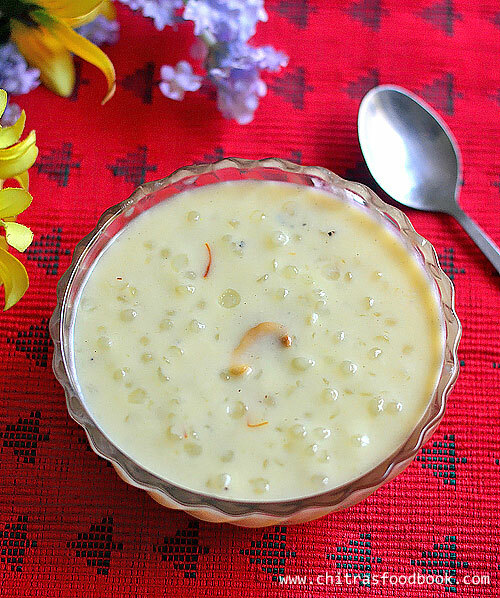 Enjoy this yummy, creamy Sabudana kheer for festivals and occasions at home. 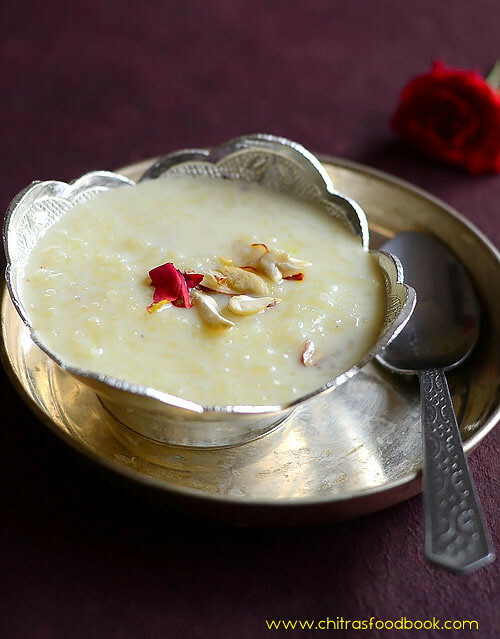 When I posted North Indian Navratri recipes for 9 days, I found Rice kheer recipe (Chawal ki kheer in Hindi) is one of the most important prasad recipes offered on Navratri 3rd day for Mata Chandraghanta & 8th day for Maa MahaGauri & Kanya puja. So I wanted to try rice kheer and post in my food book. Usually I make South Indian rice kheer (Paal payasam in Tamil) by roasting and pressure cooking rice in milk. 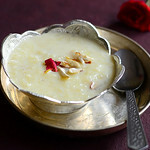 But North Indian kheer is prepared in a different method. Authentically, basmati rice or long grain rice (Chawal) is soaked in water, cooked in full fat milk in an open kadai simmering in low flame for long time. As the rice gets cooked, quantity of milk is reduced. It becomes thick and creamy. Kheer gets a natural color & sweetness from rice & milk. Then cooked rice is sweetened with sugar, boiled till thick and then flavored with cardamom & garnished with nuts. It can be served warm or chilled as you like. It tastes finger licking delicious. I saw few recipes with condensed milk (Milk maid) instead of sugar but I went with the traditional procedure & used sugar. Some people also made it with left over rice. As I had already posted Bengali Chaler Payesh, making this North Indian rice kheer was not so difficult for me as the procedure is similar. After watching many video recipes and websites, I could do it confidently. It came out really well and tasty. Even though the quantity of rice is less, the yield of this kheer is more. Sendhil & myself enjoyed it taking 2 to 3 servings. 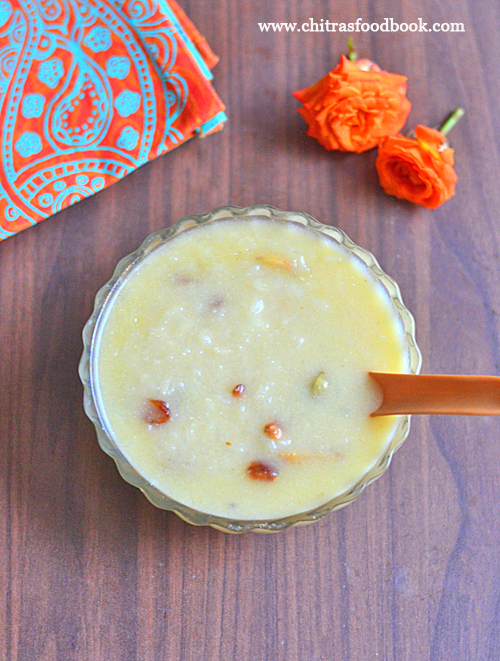 Do try this simple and easy rice kheer during this navratri, offer God and get her blessings. Soon I till try to post an easier version of this kheer by using pressure cooker & condensed milk. 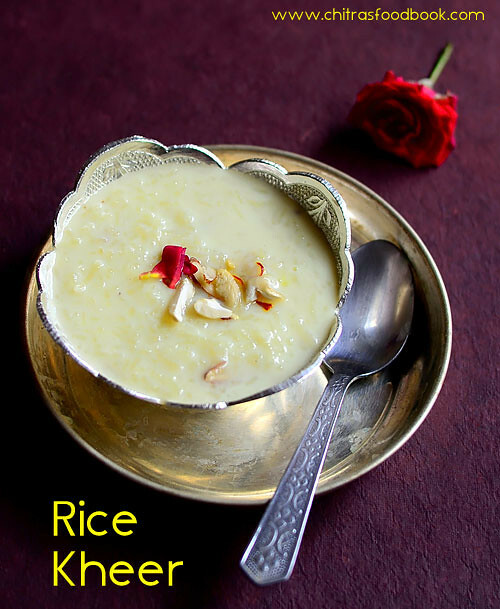 Now Lets see how to make rice kheer recipe with step by step pictures and video ! Do refer my 18 payasam / kheer varieties & Bengali Chaler Payesh recipes. Wash and soak rice in water for 30 mins to 1 hour. Roll boil milk in a pan. Add soaked rice, boil in medium flame. Stir at regular intervals and boil till rice is cooked soft. Add sugar, cardamom powder and boil till slightly thick. Garnish with chopped nuts and serve warm or chilled. Wash and soak rice in water for 30 minutes to 1 hour. Boil milk in a wide pan. When it roll boils, simmer the flame. Add the soaked rice. Cook rice in medium flame by stirring at regular intervals to avoid burnt bottom. It takes nearly 20 to 25 minutes for rice to cook. You can also cover cook for last 5 minutes to make the rice soft. But keep the flame very low. After rice is cooked, add sugar, cardamom powder.Sugar melts and kheer becomes watery. Boil till kheer becomes slightly thick.i.e when you pour, rice & milk should not separate. They should be well blended but pourable. This is the right consistency. Remember this kheer thickens when cool down. So add more boiled milk, adjust sugar if needed. Garnish with chopped nuts, saffron threads and serve warm or chilled by refrigerating it. Soaking helps the rice to cook quick & soft. If you don't have time, you can wash and cook the rice without soaking too. Add more sugar if you have sweet teeth, but not more than 1/3 cup. I have not used ghee. If you wish, you can roast the nuts in ghee and add to kheer. To make a quick version, you can cook rice & milk in a pressure cooker. You can also use condensed milk instead of sugar.Add 3 tbsp. Guess it will be enough. If you like kesar flavor, add saffron soaked milk.But color of kheer becomes yellow. 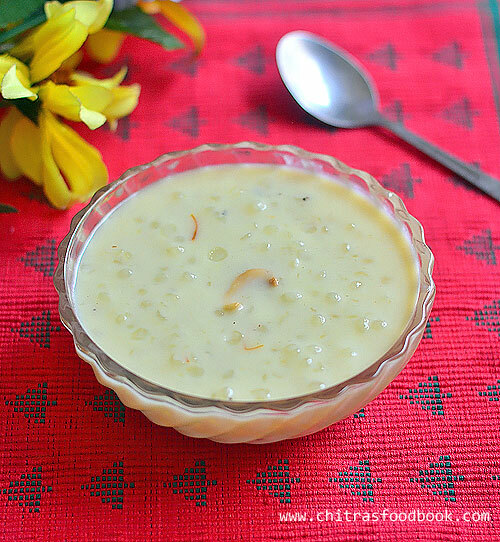 Easy to cook, delicious, festival special rice kheer is ready to enjoy ! 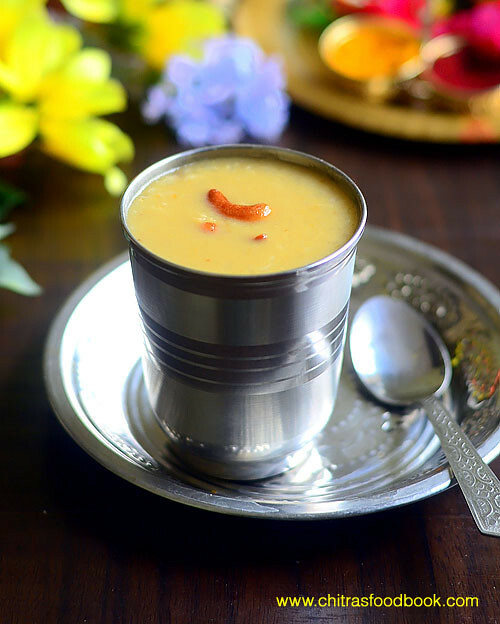 Mango payasam/ Mango rice kheer(mambazha payasam in Tamil)is an easy, Indian dessert recipe made with cooked rice, mango pulp and sugar or condensed milk. It can be prepared with cooked rice or vermicelli/sevai. 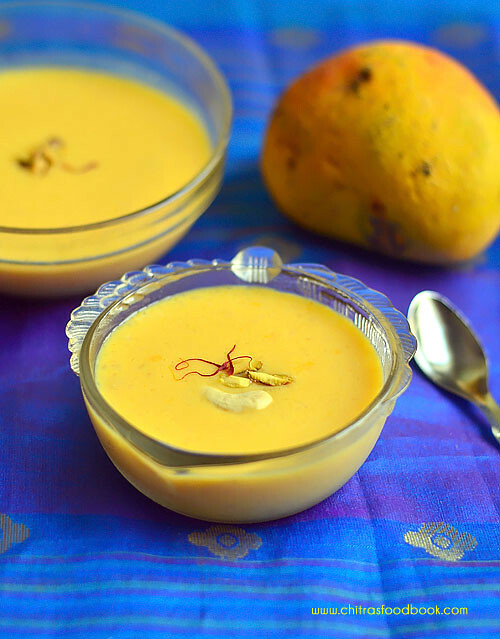 Alphonso & Banganapalli mango tastes the best for this kheer. Actually this payasam is prepared in all the states across South India in their own style. Recently I tasted this mango kheer in a hotel lunch buffet and loved its taste. It was tasting more like paal payasam with mango flavor. So I tried to recreate the same at home and prepared it adding condensed milk(milkmaid). It was tasting so rich and yummy when served chilled. Mango season has almost come to an end. This year, I couldn’t post much using mango. 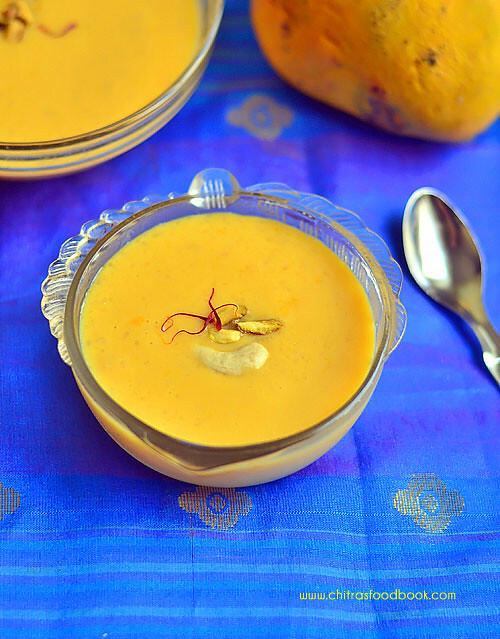 So I thought of sharing this yummy kheer as my contribution for mango recipes this year. Do try this delicious kheer and enjoy with your family. Lets see how to make mango payasam recipe with step by step photos. Roast rice in 1 tbsp of ghee till puffy. Grind it coarsely. Pressure cook in low flame for 2 whistles adding milk. Mash it well. Add condensed milk & cardamom powder, boil well. Cool down completely and add mango pulp. Heat 1 tbsp ghee in a pressure cooker base. Roast the cashews & remove in a plate. Soak saffron in 2 tbsp warm milk. In the remaining ghee, roast the rice till it turns puffy & white. Grind it coarsely in a mixie jar. Add the ground rice in the cooker, add milk & pressure cook in very low flame for 2 whistles. After the steam is released, mash the rice well. Add condensed milk, cardamom powder and boil for a minute. Switch off the flame and let the payasam cool completely. Take the mango, peel the skin and chop into pieces. Grind into smooth paste. Add this pulp to the cooled payasam. Do not add the mango pulp when the payasam in hot, milk will curdle. Add the roasted nuts. Mix well & check for taste and consistency. Add more condensed milk or sugar for sweetness & boiled milk for thin consistency if needed. You can make it thick like pudding. Mix well & refrigerate for an hour. Serve chilled for best taste. Note: Adjust the quantity of condensed milk as per your taste. 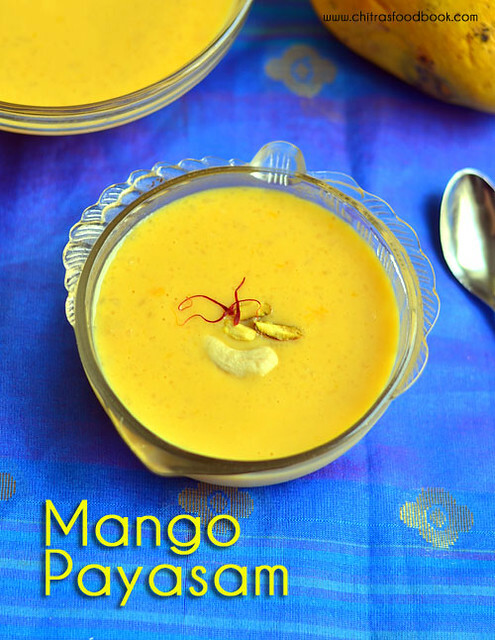 Enjoy this easy, yummy mango payasam recipe at home ! 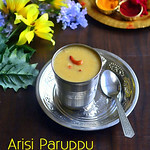 Yesterday I prepared this South Indian style arisi payasam for Tamil new year celebration. We make this payasam mainly for Tamil new year( Tamil Varusha pirappu/Tamil Puthandu) and Ganesh Chaturthi festival. Sometimes we prepare this sweet dish for Friday Mahalakhsmi pooja neivedyam too. Arisi Paruppu payasam is our family favorite payasam variety.To prepare this Indian style rice kheer raw rice, moong dal, water, jaggery and milk are the major ingredients.Sometimes I use coconut milk instead of boiled milk if making for guest or special occasions. Adding coconut milk makes it more rich and flavorful. Whenever Sendhil gets stomach upset or stomach inflammation problem, I make this for his breakfast with less rice,more dal and coconut milk as both have healing property. I will make a separate post on it later. Today I have shown the basic arisi payasam recipe/Rice kheer with jaggery and milk using a pressure cooker. You can use coconut milk in place of regular milk by all means.Sometimes I prepare the same payasam adding condensed milk (milkmaid) or sugar instead of jaggery just like paal payasam.This kheer can be done easily.Try this yummy, healthy payasam for Tamil new year and enjoy ! You can also make arisi thengai payasam on Tamil new year.Now lets see how to make arisi paruppu payasam/Rice payasam with jaggery with step by step pictures and a video. In a pressure cooker base, heat 1 tsp of ghee.Roast the moong dal till dal becomes aromatic and golden brown.Remove in a plate. Add 1 tsp ghee and roast the rice. Roast till it turns puffy and white.Its optional to roast the rice.But roasted rice gives more flavor to the kheer.So the choice is yours. After roasting the rice add 2.5 cups of water. Add the roasted dal and pressure cook in very low flame for 3 whistles till they cook mushy. Remove after the steam is released. Mash it really well. Add grated jaggery and 1/2 cup water. Mix well in low flame until jaggery melts completely. ( If jaggery has impurities, you should boil separately and melt the jaggery in 1/2 cup water, filter it and then add the syrup to the cooked rice). After the jaggery is completely mixed with the rice, let it boil for sometime till raw smell of jaggery goes off. If needed, add 1/2 cup water while boiling. Add cardamom powder & mix well. After the payasam becomes slightly thick, switch off the flame and add 1/2 cup boiled milk or thick coconut milk. Mix well and check for consistency. Add more milk if needed. Heat ghee in a small pan. Roast cashews, cloves and crushed mace till cashews become golden. Mix well and add to the payasam. Serve hot. This rice kheer becomes very thick when it cools down.So you should add more milk, water or coconut milk to adjust the consistency, check for taste. Add more sugar or jaggery syrup if needed. Give a boil and serve hot. Roasting rice is optional.But it gives a nice flavor to the payasam. If you feel jaggery has impurities, you should mix it with 1/2 cup water. Boil and melt in medium flame. Once its melted completely, strain it through a metal filter. Then add this syrup to the cooked rice+dal mixture. The quantity of milk depends on the desired consistency of payasam. You can use 1/2 cup coconut milk instead of milk. Add equal quantity of milk and coconut milk if you wish. Adding cloves and small piece of mace gives a awesome flavor to the kheer. So do not skip it. 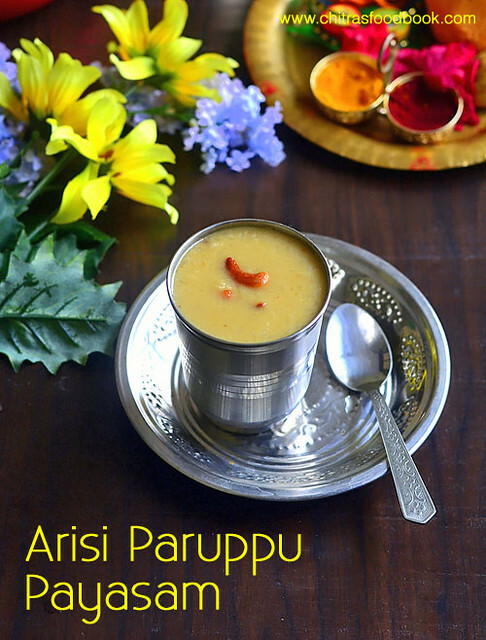 Try this yummy arisi paruppu payasam at your home for festivals and enjoy ! 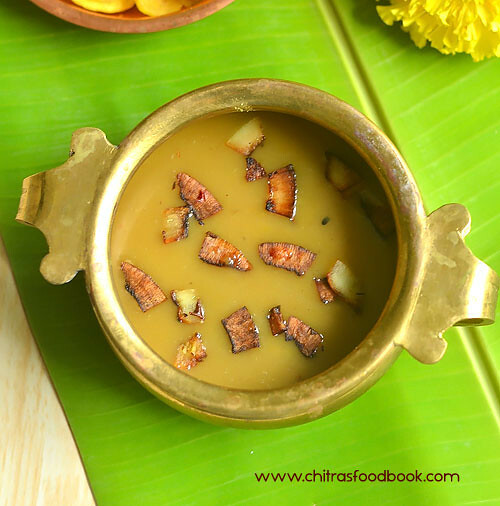 Parippu pradhaman @ Cherupayar Parippu payasam is one of the most important Kerala payasam recipes served in Onam sadya. 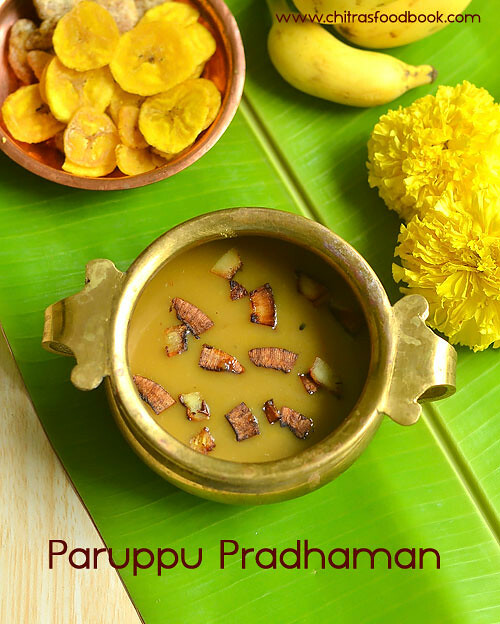 Last year I shared Ada pradhaman and palada payasam recipes. So this year I tried Pasi paruppu pradhaman with moong dal, jaggery and coconut milk. In Malayalam,it is known as Cherupayar Parippu payasam (Moong dal kheer in English).I referred many blogs for this recipe and tried it. It came out very well. 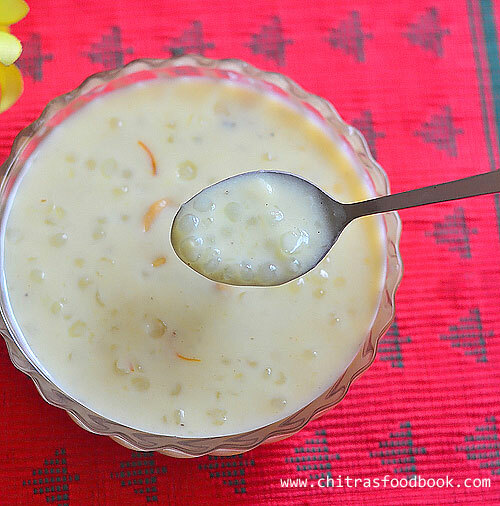 This payasam can also be made with Kadala Parippu (Chana dal). In Tamil nadu, we make Paruppu payasam with jaggery and cow’s milk. 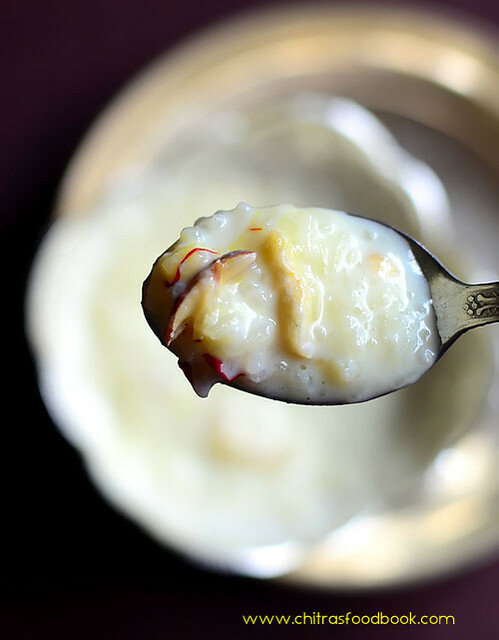 We add very little quantity of coconut milk at the end whereas this payasam is completely made with coconut milk (Thenga paal) which is the highlight of this dessert recipe. Ok, Now lets see how to make Kerala style Paruppu payasam in detail. Check out my other Payasam varieties too ! Grind 1 cup of grated coconut adding 1/2 cup of water and take the thick coconut milk. Set aside. Again add 1/2 –3/4 cup of water and grind it smooth. Take the thin milk and keep aside. In a pressure cooker base, add ghee or coconut oil and roast the coconut bits.Remove it.In the remaining ghee, roast the moong dal till it turns golden brown. Add water or thin coconut milk and pressure cook for 2 whistles in very low flame. I cooked in water and added thin coconut milk later. You can do as per your wish. After the steam is released, open the cooker and mash the dal well with a ladle or whisk. Melt jaggery in a wide bowl adding enough water and strain the syrup through a metal strainer. If your jaggery is pure, no need to filter it. Add the jaggery syrup to the cooked dal and mix well.Give a boil and add second coconut milk ( Thin coconut milk). Let it roll boil for few minutes. Once it starts to thicken, add the first coconut milk( thick coconut milk) and give only one boil in low flame. Do not boil for more time because it may curdle. Switch off the flame and add the crushed cardamom+ dry ginger( sukku) powder. Mix well and lastly garnish with fried coconut bits or cashew nuts. Serve hot or warm. This payasam tends to thicken over time.So adjust the consistency by adding little milk as per your need. Adjust the quantity of jaggery as per your taste. As per the original recipe, Dal : jaggery is 1:2. But I added 1:1.5 ratio. Add more thick coconut milk ( first extract) for richness. Do not boil the payasam for long time after adding thick coconut milk. Adding dry ginger powder gives a punch to the dish. So add it if you have in hand. If the payasam is too thin, refrigerate it for a while to thicken. If its too thick, add some plain boiled milk to bring the consistency. 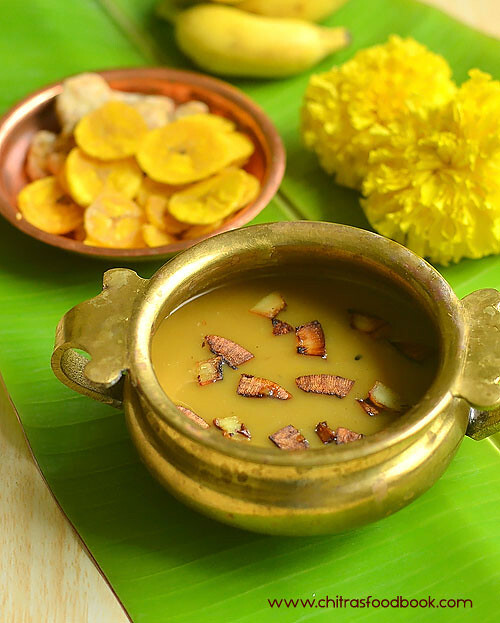 Enjoy this creamy, Kerala style Parippu payasam at home during this Onam festival !